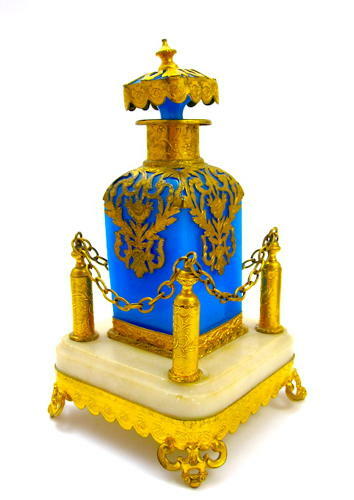 A Very Large Palais Royal Blue Opaline Perfume Bottle and Stand with Ornate Marble Base and Dore Bronze Rope Stand. The Beautiful Blue Opaline Perfume Bottle is Mounted with Ornate Dore Bronze Mounts Flowers and Scroll Work. It is Surrounded by 4 Finely Chiseled Bronze Pillars and Bronze Ropes. The Marble Stand stand Rests on a Dore Bronze Bases Decorated with Flowers and Rests om 4 Scroll Feet.